I just published a very small ebook which can be bought on Google Play Books store and previewed on Google Books. In this book, we will focus mainly on the conversion of a PDF file to a fixed layout ePub file. This is possible since the version 3 of the ePub format which includes now the fixed layout mode in addition to the traditional flowing text mode. This type of conversion can be very useful as the page layout programs (e.g. Scribus) are always exporting the final result as a PDF (optimized for paper or online publication). The ePub version 3 format uses all the modern Web technologies like HTML5, CSS3, JS, SVG, XML, XHTML, WOFF, etc. 1) This book is only about fixed layout ePub. Fixed layout can be used if the book has a sophisticated layout with lots of images. Such fixed layout books are made with desktop publishing (DTP) programs like Scribus, Adobe InDesign, Quark XPress, or Microsoft Publisher. For books with only text or with few images, a flowing text ePub is more suitable and more easy to do. 2) Most of the PDF to ePub converters do not work for sophisticated layout because they convert a fixed layout PDF into a flowing text ePub, which gives most of the time an ugly and unusable result unless the file is heavily adapted. They just extract the text and the images from the PDF, and put then sequentially into a flowing text ePub with all the layout gone. 3) Most of the ePub viewers do not support (yet) the fixed layout. If you try to display a fixed layout ePub with such viewer, the result will be ugly and unusable. Two good ePub viewers supporting the fixed layout are Google Play Books (for tablets running under Google Android or Apple iOS (iPad)) and Readium (for laptops or desktops running under Microsoft Windows, Apple OS X (Mac), or GNU Linux; it is a Google Chrome browser extension). Most of the time, small screens are not suitable for fixed layout books. Such books should be read on tablets, not on smartphones. Each ePub page is a bitmap image (PNG8, possibly PNG24 or JPEG) of an exact replica of the PDF page. This bitmap image is the result of the rendering of the text (using vector fonts), bitmap images, and vector images. To maintain accessibility (select text, copy/paste text, search text, text to speech, etc. ), an invisible text layer is added on top of the image. This is also the way used to convert a PDF file to a DjVu file. Some PDF files are also made like that, mainly when they are the results of scanning paper books (the text layer is made by OCR). Probably the best method, but more sophisticated than the first one, is to add on each ePub page a bitmap image (JPEG, possibly PNG) which is made of all bitmap and vector images of the PDF page, or a bitmap and vector image (SVG). The text is not converted in a bitmap image or inserted in the SVG file, but added on the ePub page by using XHTML5 and CSS3. The CSS uses: a) absolute positioning to put the text at the exact same place than in the PDF page; b) styles and fonts for the text to look exactly the same as in the PDF page. These two last steps are challenging, because HTML5 cannot always do what the PDF format can; lots of free and commercial tools exist, but most of the time cannot do that correctly when it comes to fixed layout. The bitmap images, the vector images, and the text are embedded in SVG files (one SVG per page). The text should be rendered as true text (with fonts), not just outlines of the glyphs (vector images). Also called: SVG in the spine (no XHTML). In the following of this book, I will only focus on the second method (image + text). There are free open source and commercial tools to convert PDF to ePub3-fxl, but some have drawbacks. This tool, as its name tells us, does a conversion of the PDF pages to HTML pages, and does not produce an ePub file. 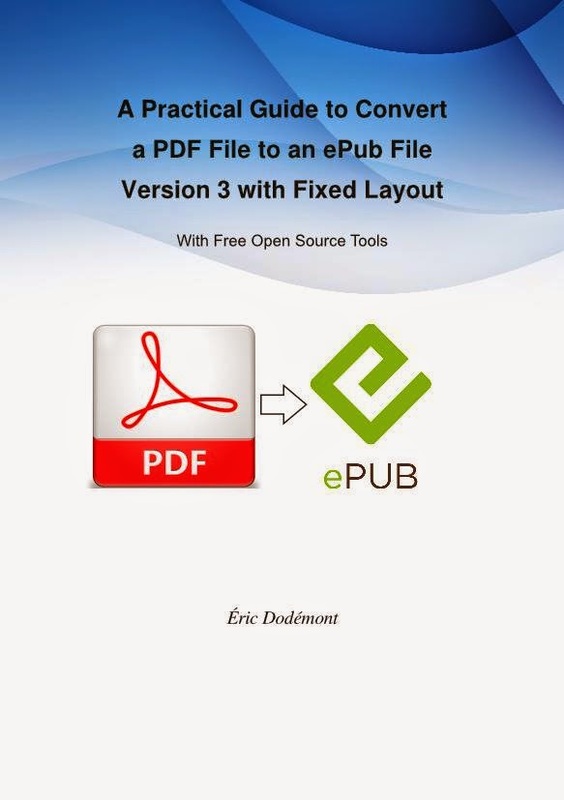 To get an ePub3-fxl file, I will show how to use the result produced by pdf2htmlEX, to create the ePub3-fxl file. It means mainly: a) remove the HTML viewer that pdf2htmlEX produces and integrates in the result; b) create all the files required by the ePub format and wrap the result into one unique file.